In early October, tapping into the Godly Play story about St. Francis seemed a natural. During the wondering time, as I listened to the kids’ insights, what their words gave me was an unexpected connection and deeper awareness of the presence, over the past decade, of a few generations of St. Mary’s people forming community and deepening relationships with the girls and staff of Our Little Roses. 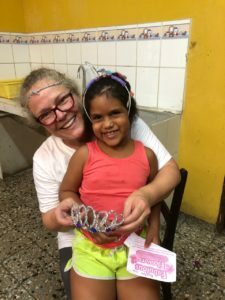 Each journey has its own stories, different experiences, different ah-has, and yet one constant: the presence of a young woman, who after graduating from UC Berkeley, had, some 30 years ago, felt drawn, with the encouragement of her Mom, yes Nancy Axell, to journey to Honduras. Kirsten Matsumoto was, and continues to be, an insightful voice, the first volunteer, and all along, a vibrant presence, in the formation and evolution of Our Little Roses. Kirsten, on behalf of St. Mary’s and generations of girls and staff of Our Little Roses, you are adapting Francis’ words: “…an instrument of peace. Where there is despair, you bring hope; and where there is sadness, you bring joy.” We thank you for your leadership and for paving the way for so many of us to experience, whether we travel there and/or support from home, Our Little Roses’ version of joy, silliness, love, and hope. St. Mary’s in Christmas at the Inns Tour!